Israel’s Tabernacle in the wilderness was constructed by Bezaleel and Aholiab under Moses’ direction. However, the architect was God himself. It was God who gave its pattern to Moses on Mount Sinai; the builders worked from that blueprint. The original Tabernacle lasted over four hundred years. Its full beauty could only have been seen by a few priests. Everyone else had only the two descriptions contained in Exodus chapters 25-30 and 36-40. These testify that the artwork of God’s architecture was meant to be admired through spiritual senses, not physical. As an architect can imagine the beauty of a building when he examines its blueprint, and as a musician is able to imagine the harmony of a complicated piece contained in a score he is examining, we likewise look into the Bible and see the beauty and harmony of God’s work of art. The Tabernacle was, among other things, an allegory. It showed in symbols the path that was yet to be opened by the reality of the body of Christ (Colossians 2:17; Hebrews 10:20). It led from the Camp of general holiness of God’s children, through the Court of justification and friendship with God, to the Holy for service by the called and chosen priesthood, and finally to the Most Holy showing unblemished, divine life in heaven. The meaning of this allegory was beautifully described by C. T. Russell in his book, Tabernacle Shadows of Better Sacrifices, first published in 1881. In addition to being a general, prophetic allegory, the Tabernacle impresses the imagination of the symbol-oriented mind through its shapes, materials, colors, geographical directions, and, most importantly, its numbers. These symbolisms function as “shadows” that not so much outline the future as show the spiritual reality that exists simultaneously with its material representation contained in the Tabernacle’s structure. Similarly the symbol of baptism shows the spiritual reality of consecration; the bread and wine used in the Memorial show the spiritual reality of the daily assimilation of Jesus’ merit. The Tabernacle’s general symbolism likewise shows the spiritual reality of man’s contact with God, the way God communicates with man, and the way a sinner approaches God. That spiritual reality spoke to the Israelites who were using the services of their literal Tabernacle, and it speaks to anyone at any time or place who wants to approach God. Most of the elements of the Tabernacle were constructed as rectangles starting from the four-sided Camp, proceeding through the rectangular Court where one found a rectangular Tabernacle within which were a rectangular altar, table, and ark. The four coverings forming the Tabernacle’s roof were also rectangles. The rectangular shape, and especially in the case of the altar with its reinforced four corners (Exodus 27:2), shows God’s mighty power, rectitude, and greatness. The laver, the only circular element, was cast from the mirrors of women who served at the Tabernacle (Exodus 38:8). A woman may be a symbol of sensuality, the flesh, as opposed to the mind, symbolized by a man. That may be why the laver was circular: the priest used it to wash his feet and his hands, leaving behind the last traces of the flesh and of his contact with the surrounding world. The golden candlestick [lampstand] was the only other non-rectangular element. It was more closely related to the number seven, which did not appear in the other dimensions of the Tabernacle and its furniture. The water in the laver, washing off what was left of carnality or the residue of “this world” as it were; the light of the candlestick with its oil, symbolizing the power of the holy spirit, was of heavenly origin. These two elements, the “mortifying” water and the “quickening” spirit, are tied together in the symbol of baptism of water and spirit (Romans 6:4). 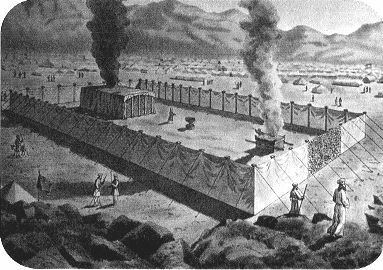 Exodus 25:3-7 mentions fifteen materials necessary for the construction and use of the Tabernacle. The number fifteen has deep significance as a symbol, and it can be associated with the number of God’s name in the abbreviated form YaH (represented by the Hebrew letters 10+5), the number of steps in Ezekiel’s temple, and the number of love’s attributes listed by the apostle Paul in 1 Corinthians 13 (see “Deliverance,” The Herald, November/December 2004, p. 7). The Tabernacle metals were gold, silver, and copper. In an allegorical sense these correspond to the divine, spirit, and human natures respectively. As symbols of the spiritual reality, they can represent moral (gold), intellectual (silver), and organizational (copper) attainment. The most-used metal in the Tabernacle was silver. The vertical boards of the Tabernacle stood in silver sockets and the the white curtain surrounding the Court was suspended from silver hooks. Thus in the structure of our spiritual communication with God, our intellectual knowledge of him, the Truth, is critically important. But the holiest communication with God is shown by gold because it is the moral attainment, though built on a foundation of truth, that determines the holiness of our abode with God. Most of the furniture and structures in the Tabernacle were made of wood overlaid with gold. Wood is a corruptible and flammable material and thus symbolizes the ephemeral condition of humanity which is suitable for use only after being ennobled by the gold of moral attainment. The altar in the Court was made of wood overlaid with copper, the laver in the Court was of copper, and the sockets holding the posts which held the white curtain of the Court were of copper. Copper, a symbol of organizational attainment, shows that the Court is the place where all believers meet spiritually. Copper gave the sockets shine and durability and was also used for the sockets of the five posts at the entrance to the Holy, and for hooks to hold the outer covering of the tent together. Thus the organizational forms that keep our fellowship together are only necessary from the outside, from a human point of view. Inside what counts is the gold of love. Where love is present, organizational “props” are not needed. The remaining materials used were cloth: purple, red, scarlet, and white (linen and goat’s hair), animal skins, and precious stones. The symbolic meaning of these materials can be understood by looking at their colors. In addition to the building materials, among the fifteen gifts mentioned are olive oil and incense, ingredients necessary in the services of the Tabernacle. These picture the power of the holy spirit, the way God affects man in prayer, or the communication of man with God, expressed in words, emotions, and attitude. The Tabernacle’s dominant color was white, as seen in the surrounding curtain and in the silver sockets. White contains all the other colors; it is the color of sunlight. White is a symbol of purity, innocence, righteousness (Isaiah 1:18; Revelation 19:8). Silver-like hair is a symbol of old age and a respectable character (Daniel 7:9; Proverbs 16:31). Red, the color of blood, is a symbol of life; in the form of scarlet it is also a symbol of sin (Isaiah 1:18), inseparably tied to the fallen and fading life of mankind. Blue, the color of the heavens, symbolizes the spiritual elements in human life. Violet is a mixture of the element of earthly life associated with sin, and with the heavenly elements. Conquered sin is the creative agent in the construction of the church, making her a merciful high priest. The reddish color of copper carries in it both the features of human life, and of sin. The one article of furniture that emerged from the wilderness different from the way it was built was the altar in the Court. The censers of those allied with Korah in his rebellion were hammered into plates and fastened to the sides of this altar as a memorial of their sin (Numbers 16:38). The axis of action in the Tabernacle was from the east to the west. When man was expelled from the Garden of Eden, God put two angels on the eastern side to prohibit access to the tree of life (Genesis 3:24). This means that man, expelled eastward, could only return by approaching westward. The path from the Camp into the Tabernacle was from east to west. The entrance was guarded by cherubim pictured in the embroidery on the curtains and by the golden statues on the lid of the ark of the covenant. This also corresponds to the meaning of the Hebrew word qedem (Strong’s #6924) which means east, and also beginning, past, ancient past (compare Micah 5:2). The Tabernacle’s north-south axis showed the duality of the structure of the material world. Every value has an opposite value. This unity of opposites was represented in the Tabernacle by the candlestick which was placed on the south side and the table of shewbread on the north side. The table holds forth material nourishment while the candlestick supplies light. Both are essential to life, but they also consist of substances quite unlike each other. The two cherubim on the lid of the Mercy Seat may suggest a kind of unity of opposites. The attitude of Satan is contrasted with that of Jesus (Isaiah 14:13,14; Philippians 2:6-8), the death of Adam is the opposite of the resurrection of the son of man (Hebrew: Ben-Adam). According to the traditional ancient interpretation of directions, a man stands with his feet in the north and points with his head to the south. These directions are also associated with colors: red corresponds to the north, and yellow east, green south, and blue west. Thus on the north-south axis were placed the two most opposing colors red and green, which neutralize one another to black. The numbers that occurred most frequently in the Tabernacle are three and five together with their derivatives (30, 50, 15, 9, 25, and so on). The number four was also represented, but more by the four-sided shapes than the actual number. The dimensions of the Tabernacle were thirty by ten cubits, the Court was fifty by one-hundred cubits. It was surrounded by a curtain suspended from posts set five cubits apart. In cubits the altar in the Court was five by five square and three cubits high. One board of the Tabernacle’s wall was ten cubits high, one-and-a-half cubits wide, and a half cubit thick; each board had an area of fifteen square cubits. The boards were joined by three groups of bars, five in each group, for a total of fifteen bars. The curtain of the Holy was hung on five posts. The Court was divided into two side-by-side squares each fifty by fifty cubits. One square held the Tabernacle or tent which had a space of twenty cubits on each side; the other square contained the laver and the five-by-five cubit square altar. A side of this altar was five by three—fifteen square cubits. Derivatives of three and five can be seen in the ark of the covenant (1½ ´ 1½ ´ 2½—dimensions that are half of three and five). The number three is connected with eternity and time in general. The eternity of God is described in the Bible through the use of three time references: “Which was, and is, and is to come” (Revelation 4:8). The number five denotes the perfection of the human nature. A human has five “endings” (head, arms, and legs), has five senses with which to experience the environment, and five appendages at the end of each limb. Since a human being is symmetrical, the number five naturally progresses into ten, the number of fingers and toes. Thus, the Tabernacle, in its dimensions, demonstrates the eternity of God’s time (the number three) as it relates to the perfection of human life (the number five). There are many interesting symbolisms in the Tabernacle’s dimensions. The internal dimensions of the Holy were nine by nine cubits.1 The volume of this room which was ten cubits high, was 810 cubic cubits; the volume of the Ark of the Covenant (1½ ´ 1½ ´ 2½) was 5.625 cubic cubits. 810 divided by 5.625 produces 144, a number associated with the church in Revelation. The Most Holy was surrounded by twenty-two boards. There were twenty-two knops on the branches of the Candlestick. This is the number of letters in the Hebrew alphabet used to deliver God’s message to man. In the Holy, the table and altar have dimensions that are known to us. Their total combined volume was five cubic cubits (the table at 2 ´ 1 ´ 1½ and the altar at 1 ´ 1 ´ 2) . The number five was contained in the total capacity of the Holy; it was 1,800 cubic cubits (9 ´ 20 ´ 10), or five 360s. This shows that the service of prayer and the feeding on the bread of the word of God was to take place every day of the year (years were considered as having 360 days even though adjustments were always made to keep the calendar synchronized with the sun—compare Revelation 11:2 with 11:3). The whole Tabernacle was held together by fifteen bars. Love, as presented by the apostle Paul, has fifteen attributes (1 Corinthians 13:4-7). It is love and holiness that made the Tabernacle an entire whole. The ark of the covenant was at the offset of the fifteenth post holding the curtain that surrounded the Court. The veil acting as a door into the Holy was suspended on five posts standing in copper sockets, which pictured the church as human beings. The veil acting as a door into the Most Holy was suspended on four posts standing in silver sockets, which pictured the divine nature of the church in the silver sockets of the wisdom of Christ (1 Corinthians 1:30). The Tabernacle was covered by a 1,260 square cubit goats’ hair layer (eleven cloth segments of 30 ´ 4 cubits each). One segment of this covering was folded in half, giving a total area of 30 by 42 cubits). This reminds us of the prophecy of the two witnesses, who prophesied in sackcloth for 1,260 days (Revelation 11:3). 1. There are two different ideas about how the eight boards of the western wall of the Tabernacle were arranged. According to one view they stood next to one another in a row with a total length of twelve cubits. That requires one board to be one cubit thick so that the boards in the north and south walls can reduce the inner width of the Tabernacle to ten cubits. But a board one-cubit thick would be heavy and impractical to transport. It is more likely that six boards stood in one row, creating an inner width of nine cubits for the Holy and Most Holy; two additional boards placed in the corners stabilized the construction (see diagram). This requires the boards to be a half cubit thick and gives the Tabernacle an external width of ten cubits. This conforms to the thirty-cubit width of the external covering over the entire Tabernacle.